In Winnipeg, we make the cold cool. We don’t just embrace winter, we hug it tight with two gloved hands before shaping it into one of the most creative scenes you’ve ever seen. 1. Ice bars baby – two of Winnipeg’s best – that being Festival du Voyageur and The Forks – have teamed up to create the Festi-Bar on Ice, an outdoor bar in the Forks Historic Port where folks can have a drink all winter long (on weekends) until the end of the season. 2. The stage is set, and it too is made of ice – on January 26 you can see Terje Isungset, an Ice Musician from Norway, perform using ice instruments as part of the Winnipeg Symphony Orchestra’s New Music Festival (January 6 - February 1). This will be staged in the brand-new Pavilion Sub-Zero, a venue for outdoor pop-up performances. 3. The world’s best river trail – You can expect to skate upwards of 10 km along the Red River Mutual Trail this winter, which stretches out from the Forks Market down the Assiniboine and Red Rivers. Plus, the trail is also ideal for sledding, dog walking and fat tire biking. All along the Red River Mutual Trail you’ll encounter Warming Huts (perfect for selfies, tying your skates, and meeting new people) made from some of the world’s foremost architects and designers, with structures that were composed by firms from Morelia, Berlin, Rotterdam, Los Angeles, Tel Aviv and Russia (to name but a few). 4. 50 years of Festival – Festival du Voyageur (February 15-24), Western Canada’s largest winter festival, is celebrating half a century this season with brand new programming, including a snow sculpting contest, an inflatable dome tent that will hold a silent dance party (attendees will be hearing the tunes on headsets), a chocolate sculpting expo, a snowshoe race, dogsled rides and events that will acknowledge the crucial role that Indigenous communities played in the fur trade. On top of that, there’s also everything FDV is renowned for, including over 150 bands, DJs and singer-songwriters, fabulous French food, Caribou in ice glasses, and plenty of costumed interpreters and other family friendly programming. 5. Where the bison roam – FortWhyte Alive is a one-stop destination for all things winter, from snowshoeing, to hiking, ice fishing, tobogganing, outdoor yoga on ice, and tonnes of weekend programming fit for the whole family. Plus, it’s home to North America’s largest urban bison herd and a farm-to-table restaurant where a great deal of ingredients has been harvested onsite at FortWhyte Farms. 6. Spa-mazing relaxation centres – Winnipeg is studded with excellent spas, including the nationally acclaimed Ten Spa in the Fort Garry Hotel – where you can indulge in a couple’s haman treatment, and Riverstone Spa at Inn at The Forks – which features numerous signature experiences, like the Indigenous hot stone massage. Perhaps the most apropos for winter is Thermëa by Nordik Spa-Nature, an outdoor oasis where you can transcend the cool air while sitting in thermal pools, before working your way through their Thermal Cycle, which utilizes Finnish saunas, cool pools, an icy waterfall, and relaxation chambers. 7. Snow-mazing – The world’s largest snow maze (they are waiting for verification from Guinness) is available for exploration at Amaze in Corn, located just minutes south of Winnipeg. Utilizing over 300 truck-loads of snow, featuring more than 1,300 metres of snow-packed walls spanning 2,300 square metres, the maze takes visitors an average of 45 minutes to navigate. Throughout its two-metre tall walls you’ll also find fire pits and various snow sculptures that will help you navigate this wintery labyrinth. 8. Puck in The Peg - Winnipeg is hockey crazy, so whether you are looking to catch a game or learn a thing or two about the history of hockey, we have you covered this winter. Both the NHL Winnipeg Jets and the AHL Manitoba Moose call Bell MTS Place home, where you can catch dozens of home games this winter in an atmosphere that is the envy of both leagues. The Moose are a fantastic and affordable option for families and groups, while the Jets – whose games are regularly sold out – have been tipped by many insiders to win the 2019 Stanley Cup (not to jinx it!). 9. The bear essentials – Polar bears that swim right over your head, Arctic foxes, muskoxen, caribou, snowy owls and seals are just a few of the animals you’ll find at Assiniboine Park Zoo’s Journey to Churchill – the world’s foremost Arctic species exhibit. As well, while you are at the park, be sure to do some ice skating on the duck pond, or head for a stroll through the Leo Mol Sculpture Garden, which is simply majestic with a fresh sprinkle of snow. 10. 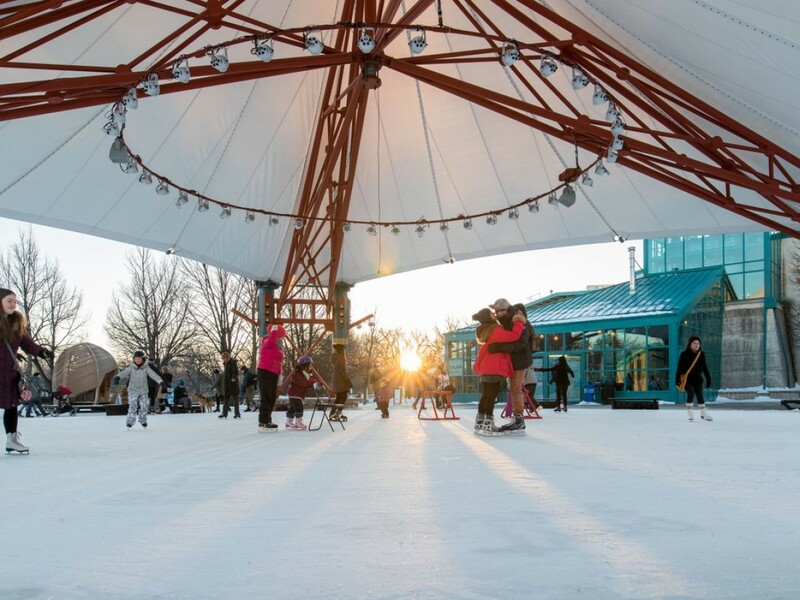 Meet me at The Forks – The Forks seriously has it all in winter, including even more skating on land in the Arctic Glacier Winter Park, where at night you’ll glide under a canopy of lights strung from the trees and archways. Weekends bring horse-drawn wagon rides, snow sculpting tutorials, and Indigenous storytelling and bannock making inside teepees – all for free! You should also après skate (or simply go for some fabulous dining) inside to The Forks Market, where there is a wine, beer and food hall, along with countless shops brimming with local designs like moccasins, candles, art and more. For more things to do in Winnipeg this winter head to our official Tourism Winnipeg Winter Website.